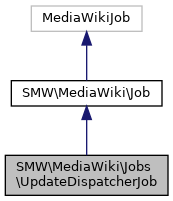 Dispatcher to find and create individual UpdateJob instances for a specific subject and its linked entities. Retrieved a job list (most likely from a secondary dispatch run) and push each list entry into the job queue to spread the work independently from the actual dispatch process. Using an entity ID to initiate some work (which if send from the DELETE will have no valid ID_TABLE reference by the time this job is run) on some secondary tables. Parameter for the secondary run to contain a list of update jobs to be inserted at once.